Acupuncture relieves pain and promotes healing by stimulating circulation, usually at a specific spot. Our trained veterinary acupuncturist has used acupuncture therapy to treat injuries and wounds, chronic conditions, and even some internal diseases. For example, it can dramatically reduce the painful symptoms of arthritis, kidney and liver diseases, and pancreatitis. Laser acupuncture can provide all the benefits of traditional acupuncture therapy. Treatment sessions typically last about 40 minutes and don’t require any recovery time at all. Amazingly, we see pets relax during their session—some even doze off!—and many show improvement after their first treatment. Unlike some medications, laser acupuncture doesn’t pose the risks of allergic reactions or adverse interactions with other drugs and won’t interfere with special dietary regimens. That means that acupuncture is a safe and effective treatment for most pets, no matter their age, size, condition, or temperament. Our veterinary acupuncturist also uses nutraceuticals, vitamins, and other natural supplements to augment the effects of acupuncture on your pet’s well-being. 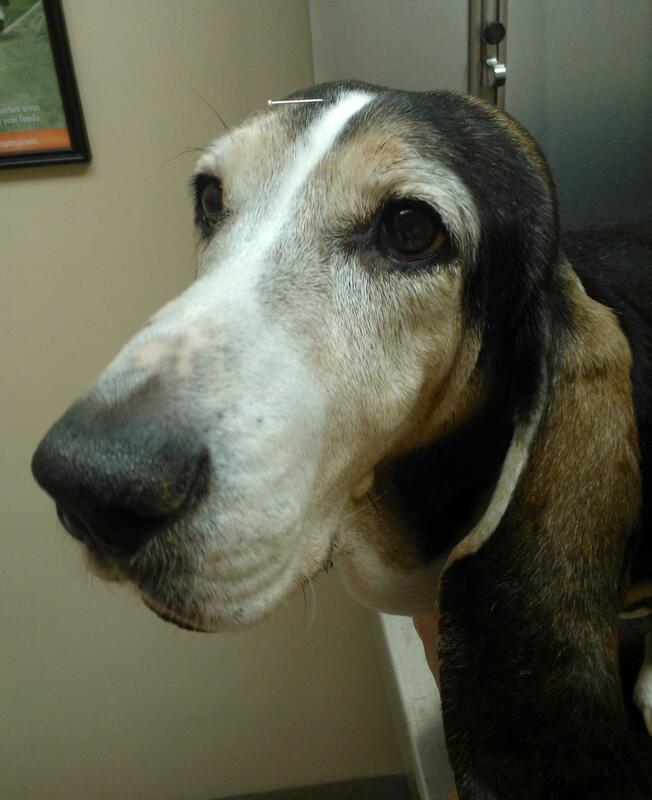 Clementine the Bassett Hound relaxes during a traditional acupuncture treatment.